Aaya Toofan is a 1964 Indian Bollywood action film released on 1964. The film is directed by Mohd. Hussien Jr., produced by Ratan Mohan under banner named R. M. Art Productions. Deepu (Dara Singh)'s son Raja Bharat is a well built man and leaves with Mallu on top of hill in a cave like settlement. A Demon once caught hold of Chanda (Helen) a beautiful girl and sister of king Raja Naagsen. The Demon extorts her but on the way meets Deepu. Deepu successfully releases Chanda from the chains of the Demon and kills the Demon as well. Before the King's men set out for search of his sister, Queen Chanda, Deepu broght her safely in his court. He is rewarded, asks the King to give away his sister Chanda to Deepu. As the King comes to know that Deepu is the son of Raja Bharat, the king acknowledges to the court that it was Raja Bharat who killed the King's father brutally by breaking his neck from his father. So the King orders to catch hero, but he escapes. After several attempts of catching Deepu, finally Kala, King's second wife, makes it possible. She acts as is she falls love with Deepu and when Deepu relents to love Kala, she orders to make him blind. The King pushes out Deepu and Chanda and order the villagers not to help them. Chanda, in order that Deepu gets his vision back, goes to find Moti. But she entraps herself in the magic world. Deepu's friend Mallu gets the Moti for him and Deepu gets his vision back. On the other side the King's court men plays tricks against him and come in command as King and threatens the King, for his life, to sign the papers which will officially make him the King of the area. But before this happens, Deepu arrives at the situation and after a long fight, saves the King as well as kills the evil court men. On seeing this the King accepts the relation of Deepu & Chanda and they live happily ever after. Check out this page for more updates on Aaya Toofan. This page provides latest and updated information about Aaya Toofan (1964) movie which released on 1964. 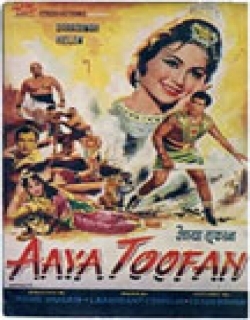 Aaya Toofan (1964) is directed by , produced by , starring .We have also provided 0 trailers and videos, 2 photos, 31 user reviews, and 0 critic reviews.Aaya Toofan (1964) has received 2.8 rating from user reviews.The overall rating of Aaya Toofan (1964) is 55 and movie is 2.8.You can review, like, dislike this movie and also can add to favorites. You can also find information on showtimes, CDs, DVDs, online rental, online free watching.